Stowe Village offers plenty to do with its shops, museums, and a snowshoe-ready recreation path. Settling in under a fuzzy blanket in a horse-drawn, cherry-red sleigh, Susan Donnelly of Boston wasn’t a tiny bit jealous of her friends who were off skiing the trails at Stowe Mountain Resort. “I had a wonderful time in the village, and really enjoyed the winter vibe. I didn’t want to give that up just because I’m not into skiing these days,” Donnelly admitted. If the idea of putting two sticks on your feet and hurtling down a mountain in the freezing cold is not your idea of a jolly old time, know this: It has never been easier to go on a “ski trip” and never actually ski. With the introduction of snow tubing, winter zip lines, dogsled rides, dedicated snowshoe trails, and more, New England ski resorts woo nonskiers with a host of wintertime activities and amenities. Not to mention, a lively après-everything scene. Don’t skip the ski trip just because you’re not in it to twin-tip it. So pull on those Uggs (no plastic boots for you!) and come along to these wintery wonderlands. We’d appreciate Stowe’s charming, European-village ambience even if there weren’t towering trail-etched mountains looming in the distance. (To clarify, there’s Stowe Mountain Resort, the ski resort, and historic Stowe Village, set within the valley between Mount Mansfield and the other Green Mountains to the west.) Even a non-skier can appreciate the Vermont Ski & Snowboard Museum (those vintage posters! www.vtssm.org), and who wouldn’t enjoy the sweet indulgence of a full-body maple scrub at The Spa at Stoweflake Mountain Resort (www.stoweflake.com)? (Them: Standing in a lift line freezing. You: Sprawled on a table getting slathered with goo.) Shaw’s General Store is a local must-see; you can use that $99 you saved on a lift ticket to buy a little something Vermont-y for your home. Outdoors, the 5.3-mile-long Stowe Recreation Path is a scenic romp, whether you’re on foot, snowshoe, or behind the Percheron and Belgian draft horses that power Gentle Giants’ sleigh rides (www.gentlegiantsrides.com). Après ski — or should we say, après non-ski — Stowe really shines. The Matterhorn and the Rusty Nail are both reliable spots to find adult beverages and gregarious company, or opt for a big-deal night out at Spruce Peak Performing Arts Center (www.sprucepeakarts.org). You’ll be the one who actually stays awake for the entire concert. Where to stay? There’s plenty to choose from at varying price points, but we can’t resist the stunning rustic-chic design of Stowe Mountain Lodge at Spruce Peak, www.destinationhotels.com. And your ski buddies will appreciate its slope-side locale. From $229. www.gostowe.com. Diane discovered Bethel’s non-skiing options the hard way — by twisting an ankle on the mountain, and being propped up on a couch for the weekend while her family skied at Sunday River. Happily, a dog sled ride with Mahoosuc Guide Service (www.mahoosuc.com) was still a go. And for sure-footed types, there’s plenty more to discover. You’ve heard about those watermelon-hued Maine tourmalines? Check out some worthy specimens, and other sparkly things, even meteorites, at the Maine Mineral and Gem Museum (www.mainemineralmuseum.org). We’re not suggesting you make a day of it at Sunday River Brewing Co. (www.sundayriverbrewingcompany.com) but you could sure spend a couple of pleasant hours there, sampling, say, a Sunday River Alt (German hops, caramel, and chocolate malts) and some “savage hash” and apple fritters. No need to sit inside for the duration; alpine skiing is just one event in this sporty burg. Go the leisurely Nordic ski route at Carter’s Cross-Country Ski Center (www.cartersxcski.com) or try fat-tire biking, cross-country skiing or snowshoeing on the 40 kilometers of Bethel Village Trails (www.mahoosucpathways.org) at the Bethel Inn. Come nighttime, seek out the action at the Foggy Goggle, the Funky Red Barn, or Suds. Where to stay: The Bethel Inn Resort (www.bethelinn.com; from $185) won our hearts when they served the baby girl in our party a warm bottle in the middle of the night, with a rosebud on the tray. Aww. They’re dog-friendly, too. The inn’s in-town location is convenient for roaming Bethel’s Main Street, and the property accesses recreation trails. www.bethelmaine.com. A two-fer: Waitsfield and Warren, Vt. The twin towns of Waitsfield and Warren in the Mad River Valley offer a cool counterculture vibe and a thriving arts scene, just a snowball’s-throw away from ski resorts Sugarbush and Mad River Glen. You could spend an entire weekend prowling the myriad galleries and studios here and not hit them all. Fuel up with a breakfast sandwich and coffee at the “almost world-famous” Warren Store (www.warrenstore.com), a general store that lives up to the name, and then make it a two-town gallery hop. Start with the Bundy Modern (www.bundymodern.com), and meander to Artisans’ Gallery (www.vtartisansgallery.com), Waitsfield Pottery (www.waitsfieldpottery.com), Moosewalk Studios & Gallery (www.moosewalkstudios.com), and any others that draw you in. Pop into All Things Bright and Beautiful (www.allthingsbright.com) on Waitsfield’s Bridge Street, to shop the owner’s handmade ornaments and well-curated gift items. This being Vermont, there’s a business devoted to small-batch beer or spirits — here, it’s Mad River Distillers, makers of handcrafted rum, whisky, and brandy. For lunch, the Mad Taco is proof that you can find good Mexican food in Vermont. (Book in advance for dinner at the wildly popular American Flatbread.) If you’ve still got some juice, and there’s white stuff on the ground, get your outdoorsy on at Ole’s Cross-Country Center (www.olesxc.com), with a workout on their 30-mile network of groomed Nordic ski and snowshoe trails. Where to stay: The Inn at Round Barn Farm (www.theroundbarn.com, from $179) in Waitsfield is one of the finest places to stay in all of New England. Twelve simple but perfect rooms are set within a 19th century dairy farm. They also have a more modern annex, the 18-room Mad River Barn (from $155), and a good on-site pub. www.madrivervalley.com. 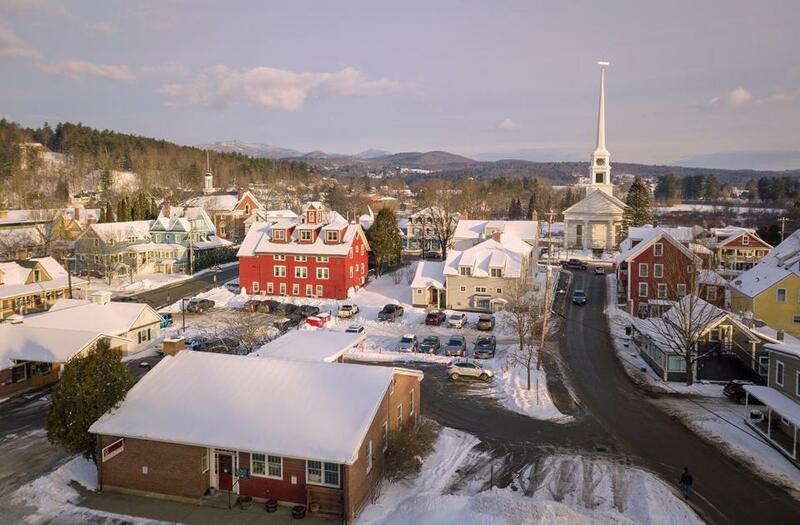 It’s no sleepy little town, but North Conway is definitely Action Central for winter fun-seekers in the Mount Washington Valley. If you’re up for thrills, just not the skiing kind, take a downhill run at Cranmore Mountain Resort’s (www.cranmore.com) 10-lane tubing park. The resort also has a mountain coaster, a giant swing, and a zipline, so you could spend all day adventure-ing while your buddies ski. If your bunch is doing the downhill thing at Bretton Woods (www.brettonwoods.com), have a go at the resort’s three-hour, 1,000-foot elevation zipline canopy tour, or tackle its rock climbing wall and bouldering cave, both located in the base lodge. If water parks are more your jam, and you don’t mind hanging with lots of kiddos, spend the day at Kahuna Laguna water park at Red Jacket Mountain View Resort (www.kahunalaguna.com). Elements include a wave pool and four three-story water slides. If your goal is sheer relaxation, it doesn’t get mellower than a sleigh ride or Victorian carriage ride surrounded by the gorgeous White Mountains. The Farm by the River B&B and Stables (www.farmbytheriver.com) offers this gentle activity on its 70-acre property. This region is also a major shopping zone, thanks to Settlers Green (70 outlet stores) and the locally owned shops in North Conway Village. Don’t miss Zeb’s General Store, named best country store in New Hampshire. And there’s this: the Mount Washington Observatory Weather Discovery Center (www.mountwashington.org), the only museum in the United States that is totally devoted to weather. It’s very hands-on, and you can even connect with an observer at the top of Mount Washington, “Home of the World’s Worst Weather.” After all of this, you’re probably ready for hearty eats. Try Horsefeathers, a local favorite. Where to stay: If Kahuna Laguna water park is on your list, it doesn’t get any easier than staying on site at the family-friendly Red Jacket Mountain View Resort (www.redjacketresorts.com; from $235). Why do we love The Wentworth inn (www.thewentworth.com, from $165) in nearby Jackson? Two words: Killer breakfast. Plus they’re right across from Jackson XC Center for cross-country skiing and snowshoeing. www.mtwashingtonvalley.org.